STEARNS, Ky. – Today, U.S. Rep. Harold "Hal" Rogers (KY-05) announced up to 350 new jobs will be created over the next 10 years in McCreary County. 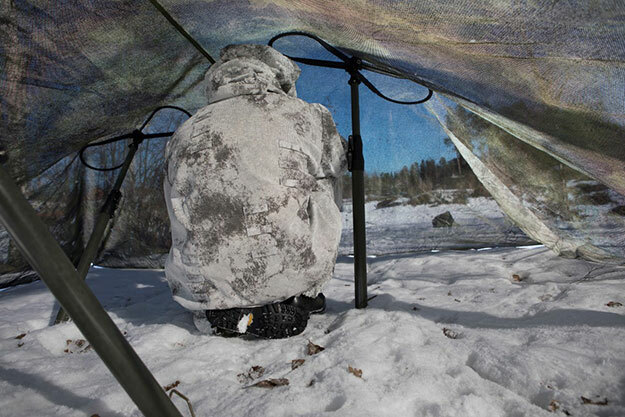 The U.S. Army has selected Fibrotex USA, in partnership with Outdoor Ventures Corporation (OVC), to produce next generation state-of-the-art camouflage netting for the military over the next decade in Stearns, Kentucky. "We have the best workforce in the country and OVC will soon make room next door for the hundreds of new jobs that our people have earned through hard work and dedication for this new military contract in McCreary County," said Congressman Rogers. "I take great pride in knowing that our people are using their talents to make products for our warfighters and our allied forces." "This is an important long-term partnership that we are building in McCreary County to supply products directly to the Army. I anticipate this friendship will far exceed the next decade," said J.C. Egnew, Chairman, President and Contracts Administrator for OVC. "Our friends at Fibrotex will retrofit the former Monticello Manufacturing building next door to OVC and will build a brand new 50,000 square feet manufacturing facility. Fibrotex will manufacture the specialized Ultra Lightweight Camouflage Netting that OVC will use to produce the final system to protect military personnel and equipment." The signature management system not only uses camouflage to hide our troops during daylight hours, but also conceals them from detection by night-vision, thermal imaging devices and other battlefield sensors. "This news, along with our recent tourism-related grant announcements for the Historic Stearns Downtown Revitalization, is another great step forward as we work together to grow and diversify the economy in our region.” said Congressman Rogers. Egnew says OVC and Fibrotex USA plan to start production in the summer of 2019 to fulfill the Army's competitive contract award. Rogers has served Kentucky’s 5th Congressional District since 1981. With a focus on economic development, job creation, fighting illegal drugs and preserving Appalachia’s natural treasures, he has a reputation for listening to his constituents and fighting for the region he represents. For more information, visit http://halrogers.house.gov/ or follow Rogers on Twitter, Instagram or Facebook. Fibrotex USA, Inc., a wholly owned subsidiary of Fibrotex Technologies Ltd., is pleased to announce that it is being awarded a contract by the US Army Natick Soldier System Center for the further development, testing and manufacture of the next generation multi-spectral Ultra-Lightweight Camouflage Net System; ULCANS. The 10-year competitive ID/IQ contract has a total value of $480M. It will be administered in two phases with a final down select by FY 2019.